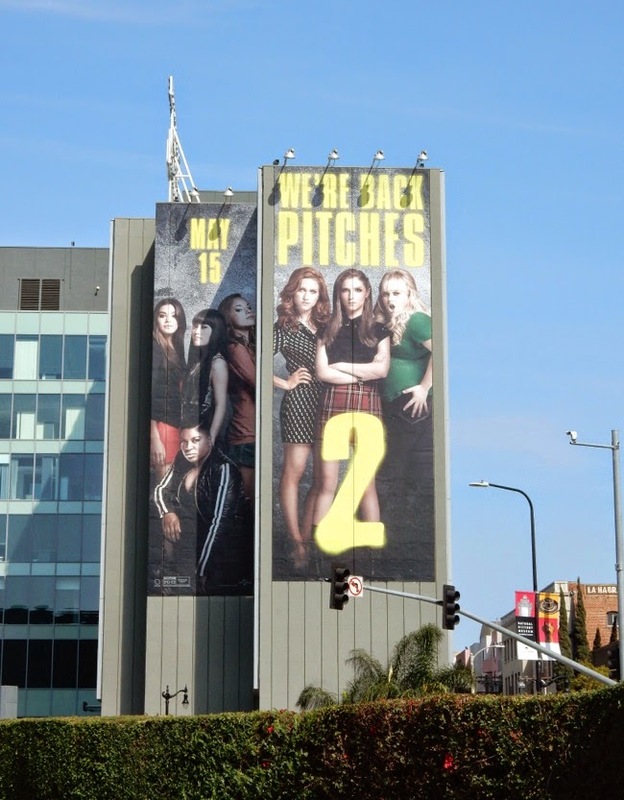 They're back. 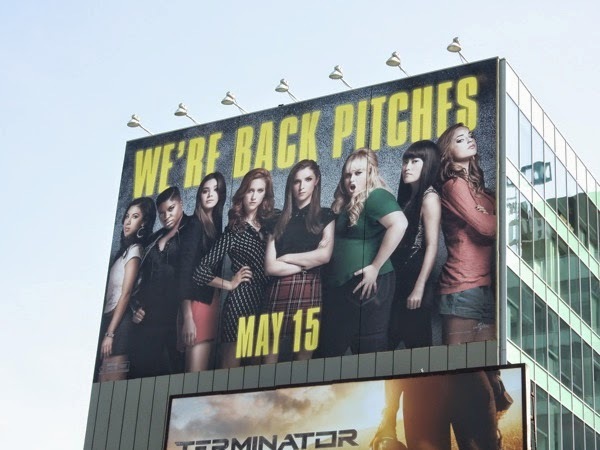 Those 'pitches' have returned to 'pitch slap' you into submission for their second a cappella outing in Pitch Perfect 2. 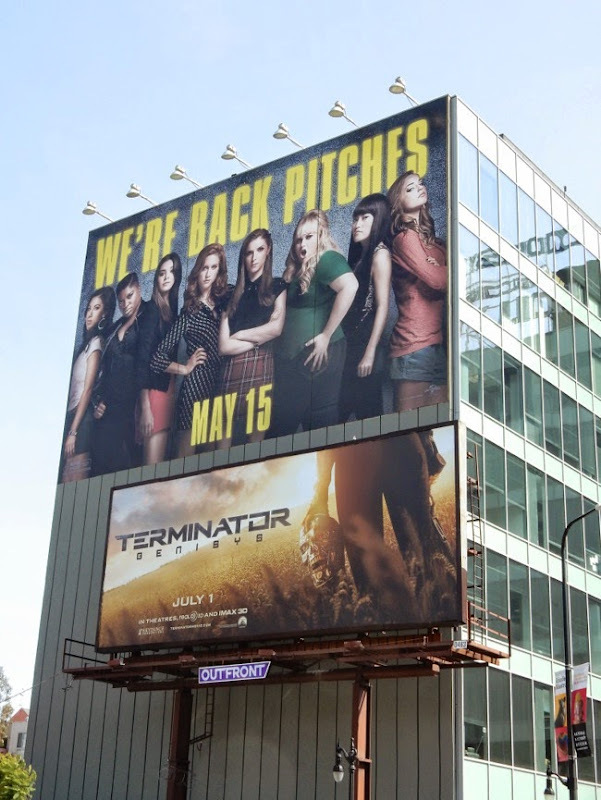 Springboarding off the success of TV's Glee, Pitch Perfect was the surprise hit of 2012 scoring over $65 million at the U.S. box office with a story about an oddball all-girl singing group taking on and beating their male University campus competition rivals. 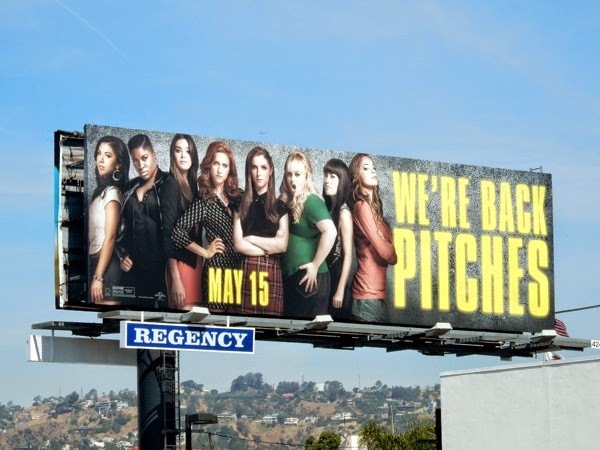 This time around Anna Kendrick, Rebel Wilson, Brittany Snow, Anna Camp and the rest of the 'Barden Bellas' throw their hats in the ring of an international show choir contest that no American team has ever won. 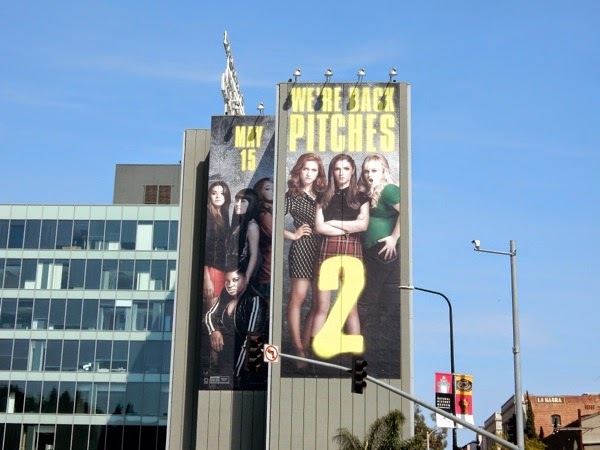 But with 'Fat Amy' on their team, how can they possibly lose (especially as she's their Australian secret weapon)? Plus Anna Kenrick has been keeping her vocal chords in tune since the last film by starring in the recent big screen Disney Into the Woods musical adaptation, so let's hope this musical comedy sequel doesn't disappoint. 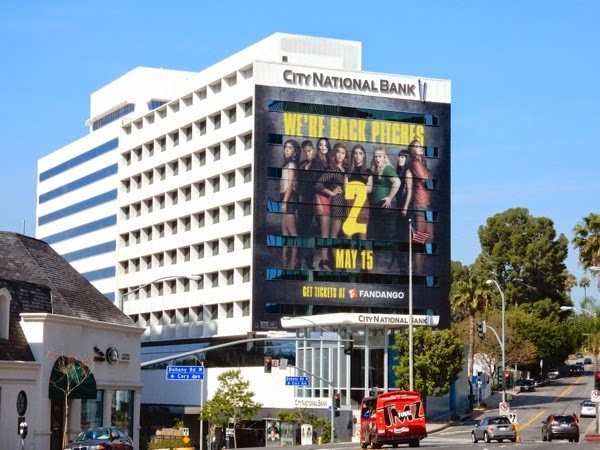 These giant-sized billboards for Pitch Perfect 2 were snapped dominating the Sunset Strip skyline and at the busy intersection of Highland and Franklin Avenues in Hollywood on April 11, 2015. 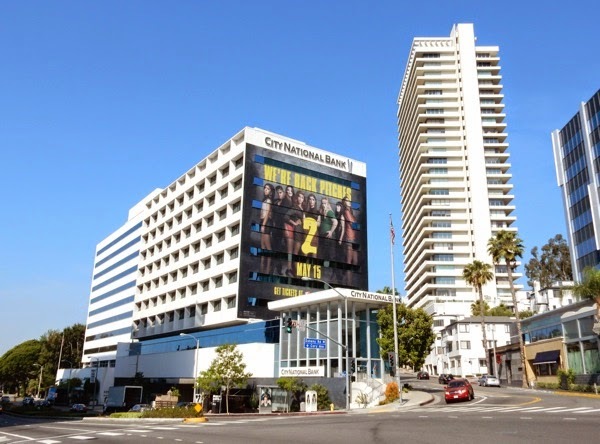 If you're a fan of Rebel Wilson, you can also check her out in this special billboard for her sitcom Super Fun Night and these Night at the Museum 3 movie billboards. 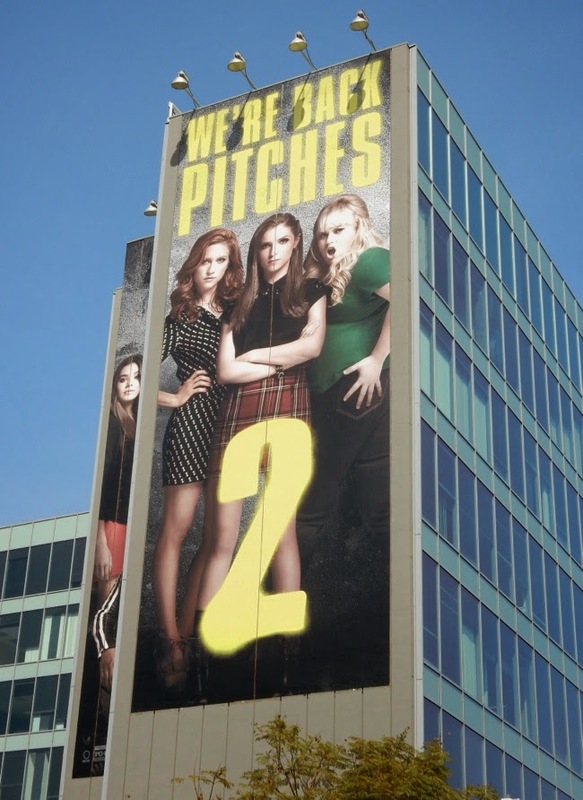 Get set for vocal mashups, wardrobe malfunctions of epic proportions and sing-offs to end all sing-offs (until the next sequel, that is). 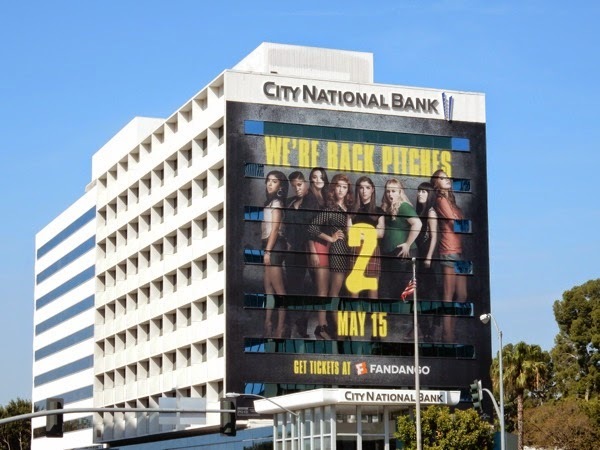 UPDATED: Here's also the standard landscape version of the billboard for Pitch Perfect 2, spied along Melrose Avenue on April 29, 2015, which like the other ads doesn't even need the film's title. Plus here's another teaser for the movie sequel spied in the Lower Lot at Universal Studios Hollywood on May 8, 2015. 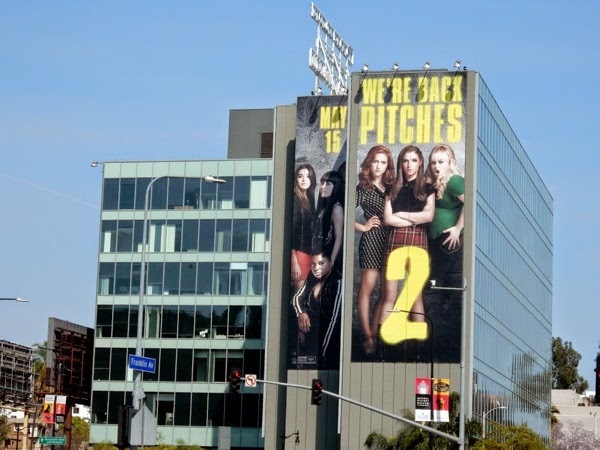 Meanwhile if you're a fan of the movie, make sure you also check out these cool Pitch Perfect 2 movie costumes on display. © Jason Morgan, 2010-2019. Unauthorised duplication of this material without express and written permission from the author/owner is strictly prohibited.